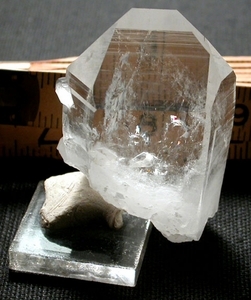 13/16x 1-1/2x 2-5/8" astounding clear Arkansas tabular rare chisel crystal with rare veil phantom, rare NINE FACES and EXTREMELY rare 3D ROUND [selene, like the moon] rainbowed inner fracture 'shells' also has two uncommon 7h faced penetrator crystals, several growth craters, and halogen-headlight style record keepers. Tiny tip fleas, common to chisel edge crystals, figured into your price. Devic veils and full-color foils complement this...rarity!